© 2010 by Alyssa Davis; all rights reserved; content may not be copied, rewritten, or republished without written permission. There are many decorating methods that you can use to help bring the great outdoors into your homes bathroom. This style of decorating is a natural for the bathroom, especially if you choose an outdoor theme that includes water. This type of decorating theme makes one think of clean, natural surroundings, which makes a perfect backdrop to give your bathroom a tranquil spa sort of feeling. 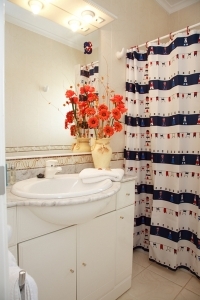 Popular outdoor themes for a bathroom are the seaside, beach, or botanical bathroom theme. For these types of themes, you will want to paint the walls a light color, such as white, off-white, light beige or a soft sea blue. You can also use a wallpaper or stencil with a beach or seashell pattern if you find that appealing, or leave the walls plain as a backdrop for other seaside decorating touches. Neutral shades of towels look right at home in a seaside themed bathroom . Or, you could use the towels to provide a whimsical beach touch by using striped towels to simulate beach towels. Use neutral or light beige bath rugs, and add a wicker basket in a corner to hold rolled up towels. Bathroom accessories look great in light shades of blues, greens and beige. White painted wooden towel bars and rings, as well as peg racks add a nautical touch to the seaside bathroom. Accessorize with glass containers filled with sea shells and perhaps a sand dollar or conch shell accent can add the finishing touch. You can use an entirely different twist on the outdoor theme by decorating the bathroom in a hunting lodge sort of style. This can be perfect for a mans bathroom. In this case, darker colors work best, including dark greens, taupe or brick colors for the walls. If the bathroom is small, dont hesitate to use a darker color, but you should try to paint all the walls the same color to create continuity, which can make the room appear larger than it really is. Choose solid colored towels, and towel bars and peg racks that have a rustic wooden appearance. In fact, its best to go with a wooden finish for everything in the bathroom, including the medicine cabinet, mirror, and any shelves. You can accessorize the room with outdoor themed art, and perhaps a rustic wicker basket filled with pine cones or other outdoorsy items. Another way to decorate a bathroom with an outdoors theme is to make a garden themed bathroom. You can go with a more overall outdoors garden theme, or choose a more feminine floral approach. Either way, the walls should be painted either a neutral color, or outdoor garden shades of light green, yellow or even lavender or pink. Once you pick an overall color theme, you can accessorize with similar colors, or add white accessories to give the room a clean and crisp look. If by chance your bathroom has a garden tub in it, this would be the perfect accessory for your garden spa bathroom. Accessorize your garden bathroom with floral or garden prints. White painted towel bars, mirrors and other accessories look more at home in a garden themed bathroom than shiny chrome accessories. Add a vase of fresh flowers or other natural materials as a final natural touch. Alyssa Davis, writes exclusively for Metal-Wall-Art.com, and specifically about designing with coffee metal wall art and butterfly metal wall art.